American Councils for International Education announces the Central Asia FLEX-Ability StartQube Workshop to be held in Bishkek, Kyrgyzstan on July 20-24 2016. 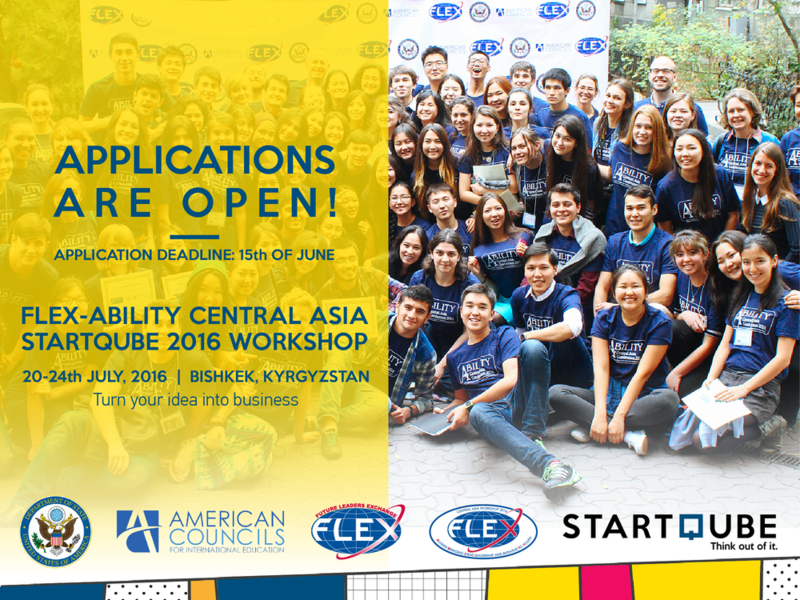 Central Asia FLEX-Ability StartQube Workshop 2016 is a five day training for FLEX alumni from Kazakhstan Kyrgyzstan, Tajikistan and Turkmenistan (living in Central Asia outside of Turkmenistan). The theme of the FLEX-Ability workshop is Social Entrepreneurship. The program includes multiple workshops that cover the A-Z regarding developing an idea into a working business, conducting market analysis and marketing strategies with social impact, access to investment, etc. The program has a strong focus on practical knowledge sharing from mentors to participants. Fifteen FLEX alumni from each country will be selected by a panel evaluators of U.S. Embassy, American Councils, and FLEX Alumni program staff based on the submitted application and proposed project ideas. Eligibility criteria: FLEX Alumni of all years from Kazakhstan, Kyrgyzstan and Tajikistan may apply. FLEX alumni from Turkmenistan, currently living in Kazakhstan, Kyrgyzstan or Tajikistan may also apply. Preference will be given to those alumni who have specific business ideas and who are prepared to hold a post-workshop training / project utilizing the skills learned at the Central Asia FLEX-Ability StartQube Workshop. Participation in the Central Asia FLEX-Ability Conference is free for the selected participants. All costs including round-trip transportation and room and board will be covered by a combination of grants from U.S. Embassies from participating countries and funding through the FLEX Alumni program. Participants may be asked to cover the cost of travel to and from their home to the capitol city of their country. Interested applicants must complete and submit the online application with all accompanying materials and a picture for the conference handbook June 15th, 2015 11:59 PM EST. Late submissions will not be accepted!